Yes! I'm ready for a new wisdom that allows me to heal my life on every level! I can ORDER NOW and SAVE $70! 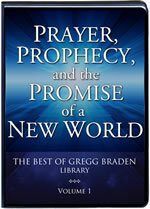 Please send me Gregg Braden's 10-CD audio program Prayer, Prophecy, and the Promise of a New World plus an exclusive DVD called "Crossroads for Planet Earth with Gregg Braden" today for just $149.95, which is $70 OFF the regular program price.